This online subscription route climbing training program is all laid out for you so that you don’t have to plan a thing. It takes you through 6-week cycles of power endurance, strength, projecting, and finger strength to keep you strong all year long. Access 3 unique workouts every week in your dashboard on your phone, tablet, or computer. The exercises are paired with videos to show you how to do everything properly. Mixture of route climbing drills on the wall, finger strength, core work, and shoulder stability. Scalable to your ability level, so strength and endurance will increase no matter how hard you climb. Neely Quinn shows you exactly what you’ll see on your dashboard when you sign up for the program. The program is extremely simple to follow due to the clean layout of the website… What makes this program stand apart from other training books is the clearly-defined “do-this-then-this” format. As long as you’re injury free and prepared to work hard, you don’t need any knowledge of training to begin your personal program. Will these programs make you a better climber? That’s up to you. Throughout the program, you’ll cycle through different 5-week training phases with 1-week active rest periods between each cycle. During each cycle, you’ll maintain what you’ve gained in the previous cycles while focusing on another aspect of training. Each bubble below is a 5-week training phase, and each arrow represents a 1-week rest period. Choose a subscription length that fits your needs. I like the route program because it forces me to acknowledge when I need rest like a coach would, but I don’t have to pay for a coach. The program helps to take the “thinking” out of climbing that you would have to do if you read the climbing training books. I used to go to the gym and just thrash around on the hardest boulder problem or route that I could do. And, taking knowledge from a book and applying it is very difficult. Now, with a set program that was not made by me, I’m way more purposeful in my climbing and working on different kinds of efforts (i.e. projecting, strength, power endurance, endurance). I train out with friends who can’t climb at my level, but since this program works for any ability level, we are all able to do the same workout. Kris Peters, Seth Lytton, and Neely Quinn collaborated on this Route Training Program. Kris Peters is a trainer who has worked with pro-level climbers including Daniel Woods, Sasha DiGiulian, Alex Johnson, Emily Harrington, Matt Segal, Matty Hong, and many others. Seth Lytton is the co-founder of TrainingBeta and is an accomplished climber (5.14b and V12) and is well-versed in training methodologies. 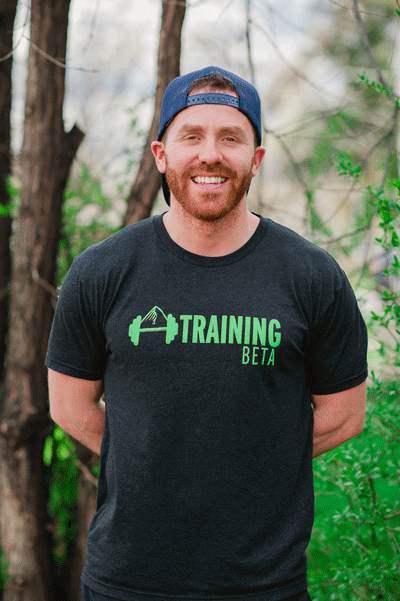 His wife, Neely Quinn, runs TrainingBeta and has interviewed 100+ trainers and climbers on the topic of climbing training on The TrainingBeta Podcast. All of their input and expertise together made this program possible. If you still have questions after reading through these, just email us at info@trainingbeta.com or call us at (650) 731-5615. They take anywhere from 1 to 2.5 hours, but almost always less than 2 hours. You can modify the program, depending on how many sets you choose to do of each exercise (given your current fitness level), and how much time you have available. We tried to make this doable for even busy climbers. Plus, we have found that it doesn't take as much time to get stronger if you're training the right way. Do I have to do all 3 days of training every week? No, you can do as many or as few of the training days as you want, or as your schedule allows. We understand that not everyone has time to train 3 days a week, so you are welcome to skip or add days as your schedule allows. Our philosophy is that some training is better than no training, so if you can only do 1 day in the gym per week some weeks, so be it. We think people do better at attaining their goals when they have a plan in their hands, and this is your weekly/monthly/yearly template to work from. What if I want to climb outside? Where does that fit in?? You should climb outside as often as you want – it’s totally encouraged. Everyone is different in their schedules and their requirements for rest days, so you’ll need to figure out how many days a week is best for you to climb. Since this is an ongoing program, you might use these workouts 3 days a week during the winter and then only 1 or 2 in the fall during prime climbing season (or vice versa depending on what your seasons look like). And that’s totally fine. These workouts are here to support you in getting stronger, but if climbing outside is making you happy and taking the place of some of the climbing days we’ve laid out for you, then that's awesome! 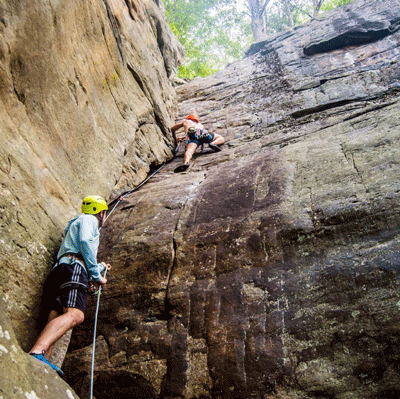 If you’re a weekend warrior, try to do the fingerboard or campus workout (whichever it is that week) on Tuesday and then one of the climbing workouts on Thursday, then climb outside on the weekends. If that’s too much, just do one of those workouts during the week – maybe on Wednesday instead to give yourself more rest days. Also, know that training like this will likely make you more tired than usual. Your outdoor (and indoor) performance may suffer, but that's a good thing. It means you're getting stronger. If you're trying to send something, just back off the training for a while and come back to it when you're ready. Is this only for route climbers or would boulderers benefit from it, too? Both route climbers and boulderers would benefit from this program. This program focuses on improving your strength, power, and power endurance, and when you improve your performance in those areas you’re improving your overall climbing ability. However, this program is specifically built to accommodate route climbers who have access to a route wall or an outdoor area with a lot of variety. There is some bouldering in this program, but you will be using route wall to complete many of the exercises. If you are looking to get stronger as a boulderer, we would recommend you take a look at our Bouldering Strength and Power Program. It has a very similar format to this program, however it focusses a little more on strength and power and doesn't require a route climbing wall. Can I complete this program on a bouldering wall? The short answer is yes, with some modifications. The program assumes that you are climbing routes that are around 25-40 moves long. So, whenever the program says, "climb a route", you can make up bouldering circuit or climb multiple problems in a row to get the equivalent number of moves at a similar grade. Can I subscribe to both the Route Climbing Program and the Bouldering Program? Yes, absolutely. In fact, this might be the best option for an all around climber who wants a large variety of workouts to choose from. We have designed a tabbed interface into the dashboard, so each program is displayed in a different tab. With a subscription to both programs you will have access to 6 unique new workouts each week. This variety will will provide you with the ability to mix and match workouts and create a more custom experience. How much stronger can I expect to get from doing this program? It depends on how long you stick with it and how precisely you follow it. It also depends on what level of climbing you're starting from. If you were to push yourself hard and stick with at least most of the program, you could take your climbing up 2-3 letter grades within a couple months on this program, especially if your max ability is below 5.11. After 3-6 months on this program we've seen people gain an entire number grade, but each person is different. If you just take it easy on yourself and don't do many of the sets and miss the workouts every week, your progress will obviously be slower. It's up to you. The longer you stay on it, the stronger you can potentially get! What time of year should I start? Any time! It's best to start this training program at a time when you want to get stronger, which is pretty much always 🙂 Seriously, though, any time is a good time to add some training into your schedule, unless you have a comp or a trip coming up in just a week or less, in which case you should be tapering and not training hard. Anyone else could stand to put 1-3 focused training days into their schedule. Is this a periodized training schedule? No, but it is cyclical. It's hard to create a periodized training schedule that serves everyone because everyone has different goals at different times (ex: I want to climb my hardest route this coming April, so I have x number of months to get to my peak). 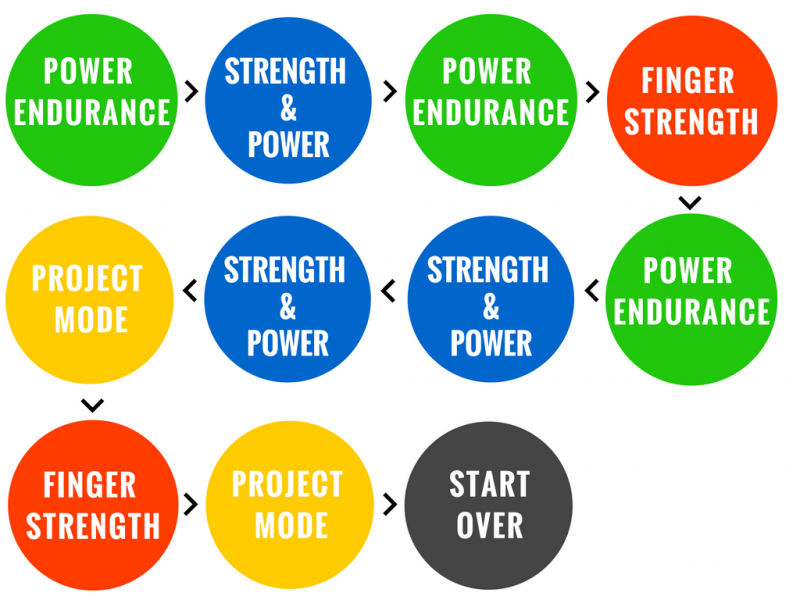 So we created a program that will cycle between power endurance, power, and strength. Having said that, even during the power endurance and power phases, you'll be building finger strength on the hangboard. And even during the strength phase, you'll be doing some power training on the campus board. And through all the phases, you'll be maintaining your overall fitness. And don't worry, there's plenty of rest built into the program (one week off of intense training every 7th week) between phases to help you recover and continue improving. Do I really have to do the running/cardio in this program? Here’s the deal with the cardio. Kris deals with a lot of people who are physically just downright unfit. They can’t run a mile without feeling like they’re going to pass out, and it takes them over 10 minutes to do it. Having a low level of fitness will not help your climbing, and working on your overall fitness will make you able to deal with doing more climbing in a day and push through being in pain (the good kind) so you can try harder in general. If you’re super physically fit already, then skip the cardio or just do what you normally do for it. Daniel Woods is not a runner, but Kris has watched him crush the treadmill at the gym. He’s super fit and it shows in his climbing. That means that Kris isn’t worried about having him run 3 days a week, or ever. If you have a base level of fitness, meaning you can walk up hills with a pack on, or jog comfortably for a mile, or ride your bike across town at a good pace without huffing and puffing, then skip it. I’m not super strong (yet) – how do I modify the exercises to fit me? The videos will actually tell you how to make exercises easier or harder. For instance, on the campus board, you can put your feet on the footholds and do the moves, or you’ll be instructed just to deadhang. For pull-ups, we’ll show you how to do negative pull-ups or jumping pull-ups so you can work up to the real thing. Every 3 weeks, you’ll be given a fitness or strength challenge, which is meant to track your progress. We’ll instruct you to record your results from those challenges so you can look back and see how much you’ve improved over time. In general, though, you’ll start to see improvements in your ability to recover, climb more difficult routes in a session, and more of them in a row. We recommend keeping notes in a journal, on your “notes” app in your phone, or in an online journal app. 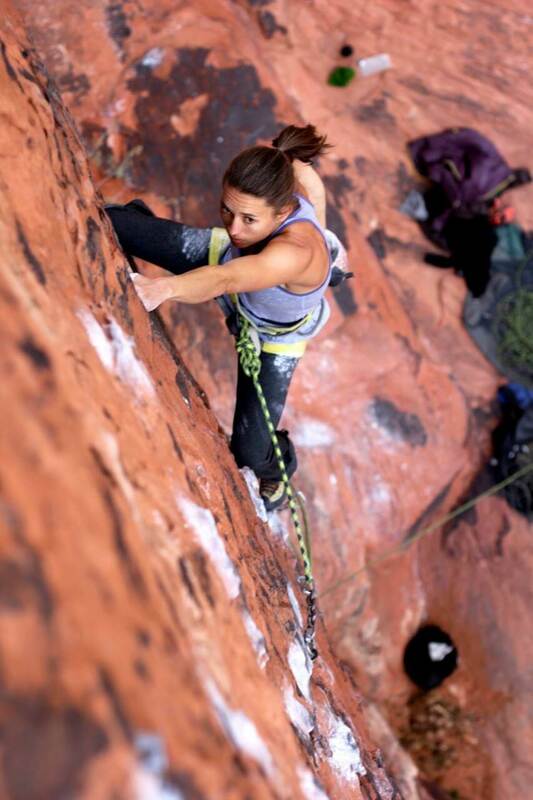 If you find a good one for climbing, please let us know at info@trainingbeta.com – we’d love to hear about it! What should my training schedule look like? That depends on whether you’re trying to climb hard outside at the moment or not. If you’re trying to climb hard outside… 1 Day During the Week Then consider cutting down the workouts to 1 or 2 per week during the weekdays, and then climb hard outside during the weekend. If you’re just going to do one day of climbing during the week, do one fingerboard/campus board workout and warm up by climbing up to 2 grades below your limit. Do this preferably on Tuesday or Wednesday so you have plenty of time to recover for the weekend. 2 Days During the Week If you’re going to do 2 days during the week, then do 1 fingerboard/campus board workout and one climbing workout on maybe Tuesday and Wednesday, or Tuesday and Thursday during the week. Do the fingerboard/campus board workout on the first training day during the week so you have plenty of time to recover before the weekend. 3 Days During the Week If you insist on doing all the workouts during the week and want to climb both days on the weekend, then do one workout on Monday, one workout on Wednesday, and the last one on Thursday. That way you at least have 1 day of rest before the weekend. That's honestly too much climbing for most people, so we'd suggest just climbing on Saturday with this schedule so you have Sunday to rest. If you’re not trying to climb hard outside… Then schedule the 3 workouts whenever you can fit them in your schedule while making sure you get enough rest. You want to have at least 1 day of rest on either side of your fingerboard/campus board workout, so that’s really the only defining rule. Maybe do a climbing day on Monday, a fingerboard/campus board day on Thursday, and a climbing day on Saturday. Or something along those lines. Is this really for climbers of all abilities? 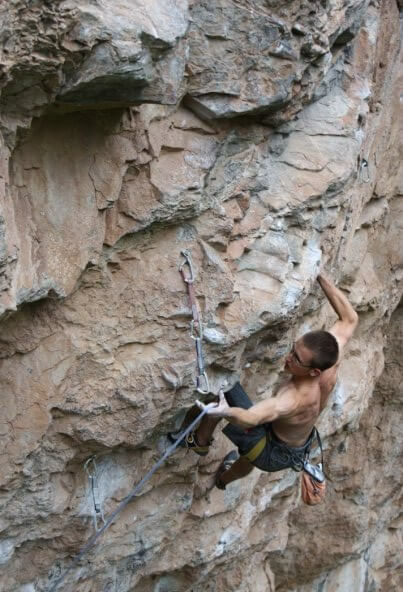 Yes, every route climber can benefit from gaining strength, power endurance, power, and cardio fitness. If you're worried about the campusing workouts, don't worry: we'll let you know if you should be campusing given your current ability level, and what to do instead of the campus workout if you're not there yet. We'll do the same with every other exercise. The last thing we want is for you to get hurt! How do I cancel? And can I cancel at any time? You can cancel your membership by logging in to your account and going to "My Account" and clicking on the cancel button. You can cancel at any time. Will I have access to the workouts after I cancel? When you cancel your membership with us, you no longer have access to the workouts. If you log in without a current membership, you won't be able to see your dashboard anymore. What if I miss a week/month and need to see a different week on my dashboard? Having 6 weeks of current workouts on your dashboard will help mitigate any of these issues, but if you ever need your dashboard to display something else, you can just email us at info@trainingbeta.com, and we'll get back to you quickly.